Here at Todd Quality Landscape Services, we have always believed that great landscapes are the result of a meticulous planning and design process. We believe that a landscape, with all its various elements actually forming into a seamless, harmonious unit does not happen by mistake but by design. For these reasons, we have always ensured that every unique landscape design we develop meets the needs and wants of our clients and that it conforms to industry standards. 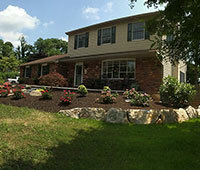 Our landscaping design services are the best that you can find in Spring City, PA and surrounding areas including Chester Springs, Limerick, Malvern, Wayne and Phoenixville. Do you have trouble envisioning a design when looking at a piece of paper with a bunch of various sized circles representing your new landscape? Don’t worry, we can help with that! With our 3D software, we can create an amazingly accurate virtual landscape that will allow you to “walk through” the entire concept! This technology is truly amazing and is a great way to be able to see what your new home will look like before we start! Your desired amenities. At the onset of our project, we consult with you on what specific amenities you want us to install in your landscape and list them down. 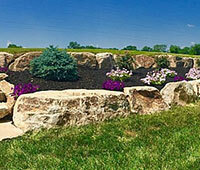 Your preferences are then grouped into softscapes, hardscapes, waterscapes and other landscape elements. Knowing exactly what you want for your outdoor area allows us to quote a working budget and also lets us come up with an initial landscape plan for your revisions and approval. Your available outdoor space. Size is essential and highly critical to any landscape design project, which is why we always conduct ocular inspection to have a definite idea of the available working space. Knowing exactly how big or small the area available for us to work on helps us pinpoint which element should go where. It also allows us to have a practical approximation of feasible elements to be included. Your property’s existing design. Most of the time, just focusing on the landscape leads to design disasters—like when your house is Italian inspired and your landscape is Asian inspired. As much as possible, there should be “agreement” between your property’s present design and the design that we will create for your outdoor area. It is called harmony in landscaping design, and it is one of the most important things we try to achieve. Your property’s drainage. This element is one of the most overlooked parts of many landscapes. Inexperienced contractors often forget a critical element - water. Having the proper contours and drainage systems in place are crucial to ensuring your investment is protected and not susceptible to erosion and ponding. We also work to route your downspouts into the yard very inconspicuously to avoid tacky looking pipes running out through your beds. When you hire us, we welcome your revisions on our design to ensure that you will be satisfied with the end product. 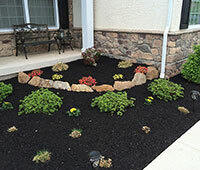 We will strategically draw various landscape elements to achieve harmony, functionality, and beauty in your property. When the final design is done, our construction team will ensure that every detail is followed to the letter. All throughout the project, our company’s owner, a graduate of Landscape Technology at Penn College, will himself oversee the project to ensure its success. While this type of hands - on commitment is unusual in most companies these days, we are dedicated to ensuring you are completely satisfied with every part of your experience working with us! Whether you want just a few new trees to screen out a view, a new front landscape, a backyard retreat, or even a master plan for your property, Todd Quality can help. Starting with the initial consultation, we can help you determine your needs and suggest creative options that will enhance the beauty of your home while staying within your budget. To top it all off, all our plantings carry a one year warranty!